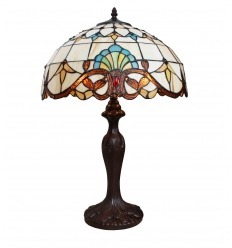 Large Tiffany lamp of the Paris series, with a patinated metal foot in bronze color. Stained glass of art nouveau style, white, blue, green and yellow. Height: 61 cm - Diameter of the lampshade: 40.5 cm. Tiffany lamps are sold electrified and all have CE and RoHs certification (lead-free and mercury-free warranty).